While it may not be possible to draw a direct line from the Woodstock Festival of 1969 to Guildford in 2018, it doesn’t mean we won’t try. 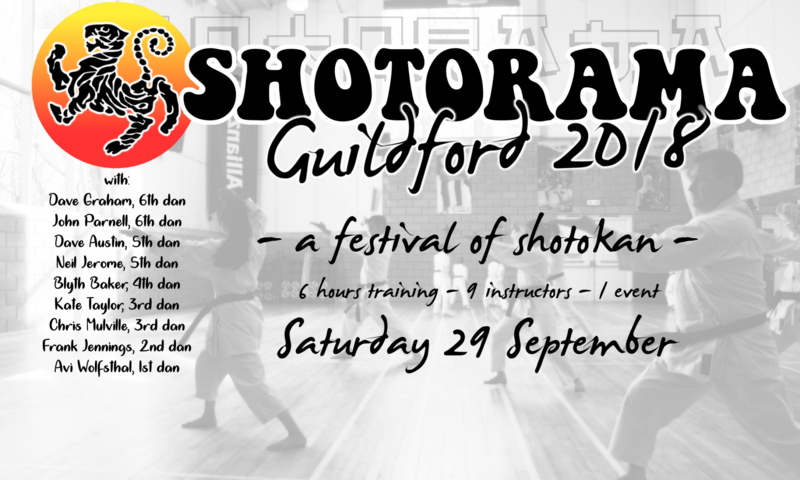 One Thursday, over a drink after a club training at Kanshin, a small group of karateka got to talking, and piece by piece a manifesto was drawn up for what would, as you already know, become SHOTORAMA. most instructors teach for love of karate, and the joy of teaching, but this is often lost in everyday training. many of the friends we make in the karate world, through courses/competitions, are gifted instructors that we might never get to train under, only alongside. all instructors, like all students, bring something unique to their clubs. it is great to train and mix in with instructors and students from other clubs. …it seemed crazy not to do something about it. We raised our glasses and felt extremely happy with ourselves. And it might have ended there, were it not for the tenacity of Avi, who was already researching times and locations, and emailed us at half past one in the morning that very same night! Some of us, it seemed, had been thinking about this for a fair while longer, and apparently the idea had been brewing ever since a conversation long ago with Dave Austin. I recall having some of those conversations with the man myself over the years. Almost by default, John and I were on board; how could we not be? Instead of conspirators, we had become the committee. We started to scheme, or whatever it is that committees do, and while Avi beavered away on the logistics of getting a space big enough for long enough for something special, I sent waves of emails out to our friends across the region. Chris was the first to jump on board, which gave us the faith we might connect with an audience, while Blyth and Kate kept us on tenterhooks for a while before coming up trumps, and John confirmed for Dave G using rokyudan telepathy. We managed to coax Frank out of central London. Other friends expressed interest combined with regret that they had clashes for that day, and their names were quietly put on the secret list for 2019. If you build it, they will SHOTORAMA.